Outer Body Experience soaps are handmade in small batches using only the finest ingredients. We use olive, coconut, and palm oils in every bar, along with wonderful moisturizers such as shea butter, sweet almond oil, or avocado oil. Botanical ingredients, some grown in our own garden, produce the natural earth tones in each bar. Essential oils are used to create the unique aromatherapy blends that make our soaps so special. Each bar is more than a hefty 4 ounces. Rose, Lavender, and Oats and Honey are the most moisturizing due to the qualities of the essential oils and herbs in them. Q: Can I use this soap on my face? A: Definitely! Just as it is moisturizing for the body, our soap is moisturizing and cleansing for the face. For exfoliation, try Oats and Honey. For acne, try Mint. Mature or dry skin benefits from the oils in Rose. Sensitive skin will love Calendula, Chamomile, or Lavender. Or, try another one and see how you like it! Q:Your soap packaging reads "for body, face, and hair." Can I really wash my hair with your soap? A: It's primarily what we use to clean our hair. Our soaps will clean and nourish your hair and scalp. 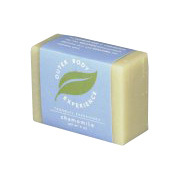 Unlike liquid shampoos that contain detergents, our soaps are veggie based and very gentle. Less packaging and waste, too! Q:Which soap is the most moisturizing? Chamomile Soap - is shipped in a discrete, unmarked package. Orders are processed immediately and usually take about 3 to 5 working days to be received. We do ask that you try it for 2 to 3 weeks to feel the full effects. Any information received is used only for order processing and shipping purposes. Your information, such as e-mail address, will never be disclosed to a third party.